The remarkably clear, non-distorted 3D image resolved by the GL Series optics is a result of advanced technologies in optical design. The GL Series Greenough design produces lifelike images in a large field of view and presents upright or erect images with astounding depth perception. A long (100mm) working distance facilitates observation. Specifications on the following two pages. 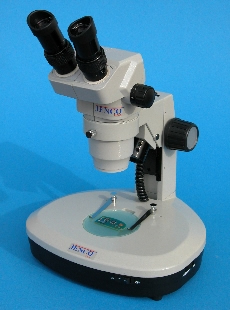 Pictured here, the Illuminated stand allows observation of both opaque and transparent specimens because of individual controls for reflected and transmitted light. While reflected or incident light is a 15W Halogen with electronic dimmer, the transmitted light can be either a 15W Halogen with dimmer or a "cool" 5W fluorescent bulb for heat sensitive samples. individual lighting controls provide ideal conditions for photographing images in a fully illuminated field. 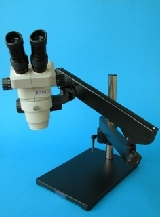 All models include: a pair of 10X eye pieces, black/white reversible stage plate, dust cover, power cord and instruction manual. With over thirty (30) combinations of stands and optical bodies from which to choose, the GL Series has a model to satisfy your application. Which one is right for you? GL7 Optical Body - brilliance, clarity, parfocality, flatness and depth of field characterize this hard working model. 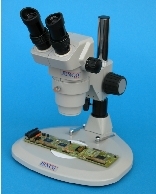 Its wide magnification range, (7:1 or 0.65X to 4.5X) zooms in on your specimen without distortion, delivering a resolved image true to character. The detents at 0.5X allow exactly repeatable magnifications for documentation. 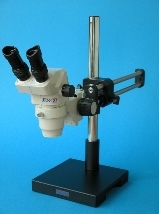 GL6 Optical Body - designed for those demanding applications where you are challenged with new and different specimens requiring absolute clarity at all powers, this model achieves high magnification (1.0X to 6.5X, 6:1 ratio) at a low price. 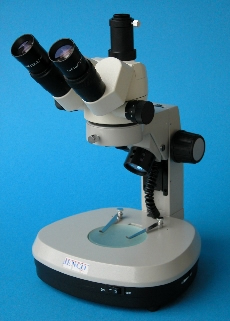 Going beyond the standard for this class of microscope, total magnification ranges from 0.5X to 260X with optional auxiliary lenses and eyepieces. The Post and Boom stands are heavy duty and designed to provide ample support for many years. Allowing freedom of movement in multiple directions over the work area to facilitate inspection of large samples, their rugged structure minimizes vibration and tipping, even on a Trinocular head with camera attached. Superb resolution meets demands in semi-conductor/high tech industries, medical device assembly and life science research. Standard Boom is economical and well-matched to applications where continuous horizontal movement is not required. 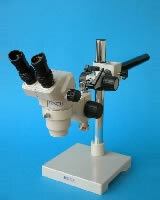 Used in medical device assembly where work stations and repetitive actions are common. Smooth Boom got its name from the smooth gliding motion produced by the ball bearings in the horizontal movement. Ideal for scanning large parts, like a circuit board, simply with the touch of a hand. Articulating Arm Boom features a counter balanced arm that moves vertically as well as horizontally, making it ideal for tight spaces. DG Series replaces the Z7 Series. 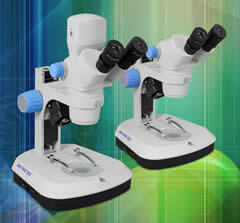 Combines excellent optics with modern design for comfort/ease of use and you have the DG Series of Stereo Microscopes. Their affordability belies their performance: a zoom ratio of 7.6:1 produces a 6.6X to 50X magnification range. Durability to prevail beyond its 5 Year Warranty comes from the DG all metal focus mechanism and wide band coated optics. Welcome the DG into your analysis to unleash new discoveries without demolishing your budget. The Illuminated Stand - observe both opaque and transparent specimens using individual controls for the 5W upper LED and 3W lower LED lights. This bright cool light is good for heat sensitive samples and longevity of 10,000 hours.